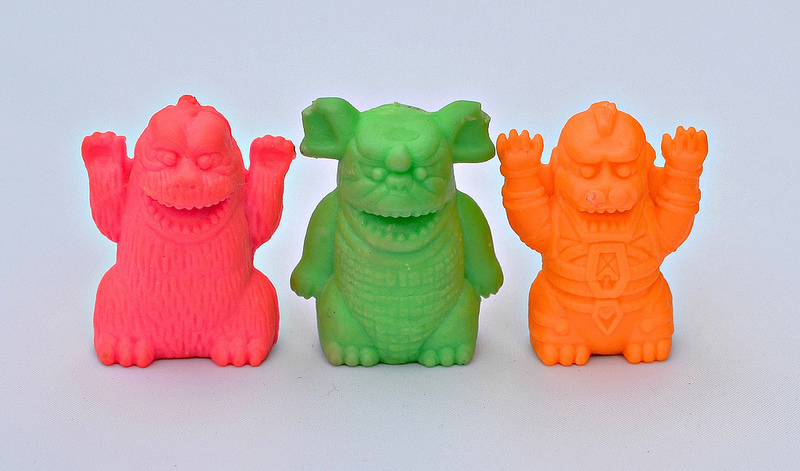 What: Here are some kaiju pencil topper erasers I've had since I was a little kid. I've got four different sculpts and six different colors. They're made of an eraser material and have holes underneath so you can pop them on top of your favorite writing utensil. I'm assuming they're bootlegs of some Japanese line of Godzilla keshi or something like that (could the dark blue guy be Godzilla himself? I'm not sure). When: I got these sometime in the late-'80s, early '90s. Where: I think they were sold in sets of two or three at Walgreens, but I could be mistaken. It was a long time ago. Pretty sure the red/pink guy is Godzilla. The light blue/orange one is definitely Mechagodzilla, and the green/other orange one is Baragon. The dark blue one doesn't seem to be part of the same series. Thanks for that info. I'd agree with you about the dark blue one, except I got all these new in packaging as a kid and I'm sure he was part of the set.